David C. Danel is the founder and President of the Marine Reconnaissance Foundation. David retired from the Marine Corps in 2013 as the Reconnaissance Training Company First Sergeant. During his 21 years of active duty, he served in Recruit Training Command as a Drill Instructor, 1st Reconnaissance BN, 1st Force Recon, and Marine Special Operation Command. David served multiple combat tours in Iraq and Afghanistan. 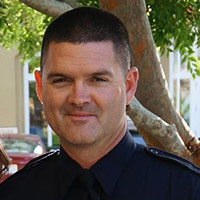 David lives in Northern California and is a Deputy Sheriff for Tuolumne County.